We will provide finger food and entertainment. BYOB. Museum tours will be available. Your Reunion Committee has come up with a great package for our 75th Birthday Celebration. If there are any of you who have not seen the Port Arthur Museum, there is a lot to see. There is something new every time I go. And just in case there is a classmate who hasn't attended a Reunion or a class get together, this is your chance. It's a one day affair and won't take up a lot of your time. Place: Museum of the Gulf Coast (make The Drag and come on in), 700 Proctor Street. The entrance is on the 4th Street side. There is free parking there. Cost: $4 entrance fee. We are providing lunch and non-alcoholic beverages. BYOB. Docent guided tours of the Museum will be available. A tour of Woodrow Wilson will be conducted from 3 to 4 with PAISD Superintendent Dr. Mark Porterie as our guide. Tentative Port Arthur tour plans – Pleasure Island Boardwalk and Nature Trail, Woodrow Wilson, down Lakeshore past Rose Hill or on the seawall and possible drive past elementary school neighborhoods and TJ on our way to The Schooner, which is in its original location on the corner of Memorial and Hwy 365. 5:30 p.m. Party Room reserved, will seat 42 comfortably. Crawfish bisque available for an addition $3.99 per person. Linda also encourages all of you to go by your childhood home (if it’s still there) before going to The Schooner. Note: Woodrow Wilson is now an Early College High School. When students graduate, they have two years of college credit. It is newly refurbished. TJ tee shirts. They are available at the Museum($16.24) and on line at the Museum Gift Shop for $20(shipping included). https://www.museumofthegulfcoast.org/gift-shop. 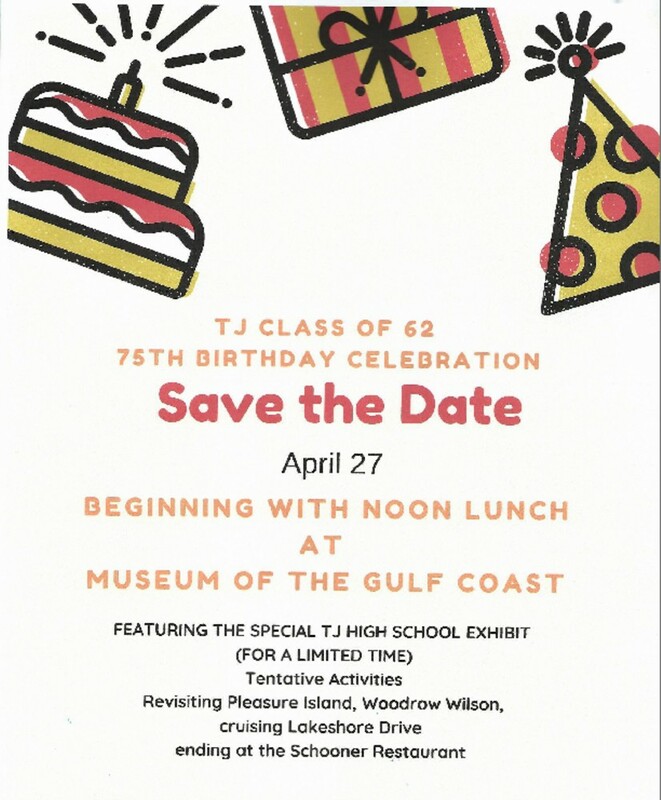 Attached is the “Save the Date” announcement for our 75th Birthday Party. 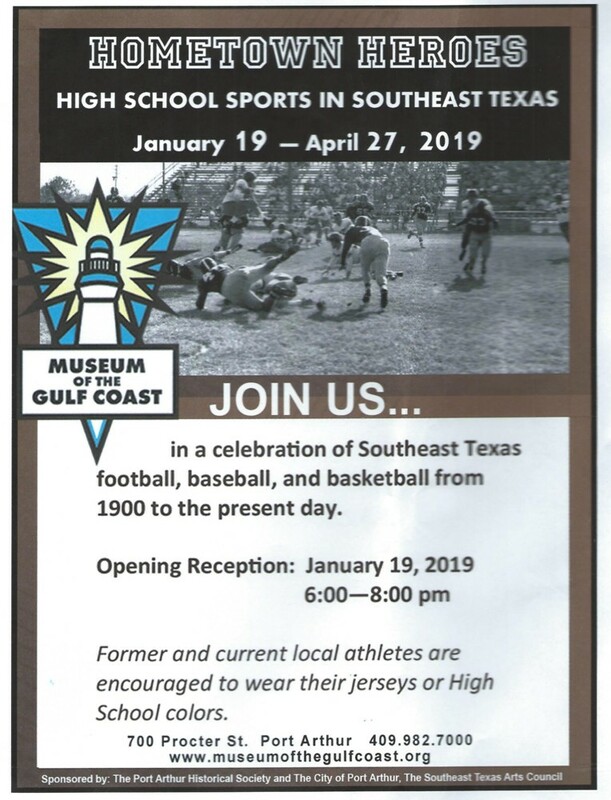 Below is a flyer about the “Hometown Heroes” exhibit currently at the Museum of the Gulf Coast. It will only be there until May. Our own Ronnie Thompson and his “Another One Bites The Dust” TJ team from the early ‘80s are given prominent mention in the exhibit. We hope you will join us there on April 27th. We will then meet at The Schooner at 5:30. Please RSVP soon. If you are just attending one function, please let me know.